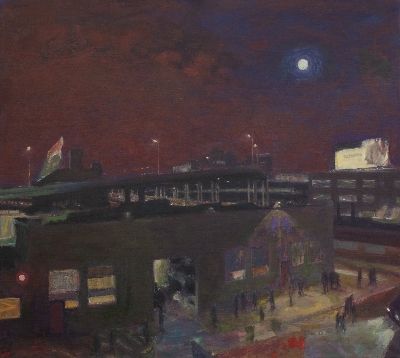 In 2002 after more than 20 years painting at Union Square, NYC, Violet Baxter moved her studio to LIC,, where she has made many variations of what she had seen from her studio windows including the highways to the bridge and the factory building, and reflections in the night windows. Formative years of abstract painting at Cooper Union, Columbia Univ. and Pratt Inst.still informs her personal visual language. Her interests are taken by the elusive light of day and night and the reflections in her night window. 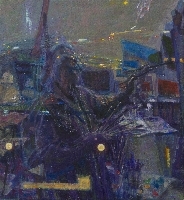 Exhibitions include solo shows at Jeffrey Leder Gallery, LIC (2012), Southeast Missouri State University Museum, and The National Arts Club NYC and group shows at Mishkin Gallery, Baruch College, NYC, National Academy Museum, NYC, Lori Bookstein Fine Art, NYC, David Findlay Jr. Fine Art, NYC, Marymount College/ Fordham Univ. Tarrytown, NY, Mercer County Community.College, NJ. Reviews and articles most recently in Hyperallergic, Times Ledger, LIC Courier, US1, exhibition catalogue, etc. Working from my drawings done from direct observation, I look to nature as a guide. My first response is perceptual and intuitive. My inner senses draw me deeper into the work. Describing the planes and forms in space, how the surfaces feel, I seek the rhythmic organization of space. 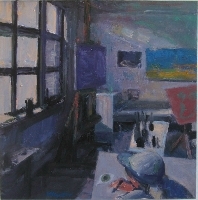 This allows me to remember the experience and enables me to translate it into a painting. These concerns remain the same in both city and country settings and are equally important for both drawing and painting.